She Leads Africa is a community that helps young African women achieve their professional dreams. With engaging online content and pan-African events, our vision is to become the #1 destination for smart and ambitious young women. To join our online community, visit us at SheLeadsAfrica.org or sign up here. Fresh Direct Produce and Agro-Allied Servies - Agriculture + Technology + People = SUCCESS!!! 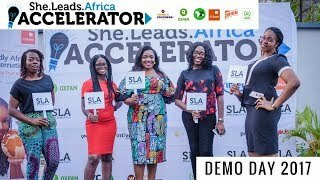 We are so excited to officially announce the launch of the She Leads Africa Accelerator – a 3-month program designed to identify, support and fund the next generation of Nigeria’s brightest female entrepreneurs. Entrepreneurs will receive exclusive access and mentorship from some of Nigeria’s leading business personalities, pitch day in front of local and international investors and secure features in local and international media outlets.